I am an associate professor in the Distributed and Embedded Systems group at the Department of Computer Science at Aalborg University. Self Energy-Supporting Autonomous Computation funded by the EU under FP7 2012-1015. 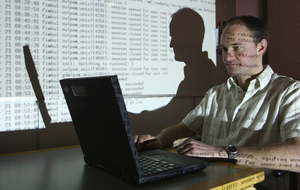 Model Based Analysis and Testing of Embedded Systems (MBAT), funded by ARTEMIS. Certifiable Java for Embedded Systems (CJ4ES@googlecode), funded by the Danish Research Council for Technology and Production Sciences 2011-2013. Improving Security of Infrastructure Software (ISIS), funded by the Danish Research Council for Technology and Production Sciences 2008-2011. In collaboration with Julia L. Lawall at DIKU. The project is based on the Coccinelle tool (coccinelle@github). My main research interests are language-based safety and security, static analysis, programming languages, and programming language issues in operating systems. A detailed list of publications is available here (DBLP, VBN). A list of current and former students is available here.